When you think of iconic sports figures, you think of Mickey Mantle, Babe Ruth, Joe DiMaggio, Michael Jordon, Walter Payton, plus many more. These players for ever changed the landscapes of their respective sport, and for many collectors, a number of their rookie cards have defined generations of collecting. A 1986-87 Fleer Jordan, 1989 Upper Deck Griffey, or a 1952 Topps Mantle are works of art, some have even been displayed in museums, and many more are staples in collectors personal collections that adorn den’s and offices around the world. Without a doubt, on the biggest names in sports today is LeBron James. Millions of us tuned in just to listen to him talk about his free agency decision, an unprecedented move. 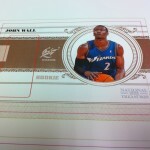 King James has helped redefine the Basketball card hobby. 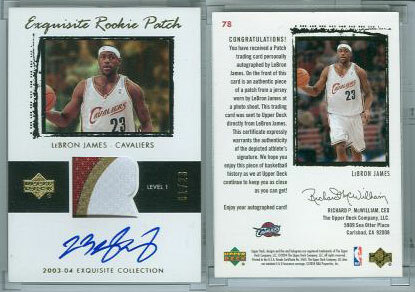 During LeBron’s rookie season, Upper Deck unveiled a new line of Basketball cards called their Exquisite Edition. 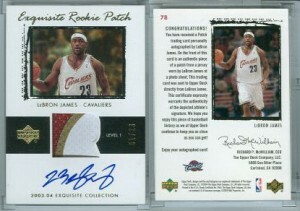 LeBron’s 2003-04 Exquisite RC Auto/Patch has recently been listed on eBay. Recent sales for an ungraded version have been in the neighborhood of $16,500. With a print run of only 99, game-used patch, and of course a gorgeous on-card autograph, this card has become of the modern era’s most iconic and desired cards among collectors. Tough decision, a new car or that LeBron rookie card?